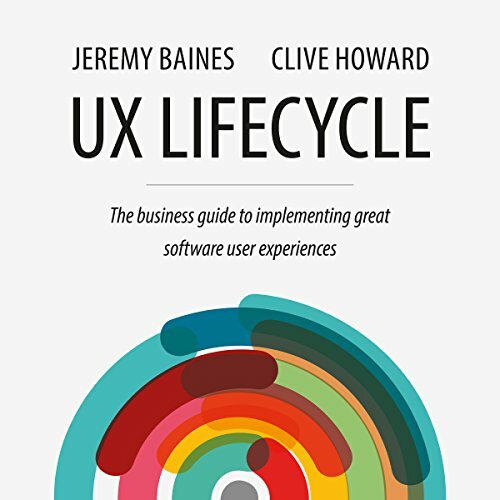 Clive and Jeremy have helped businesses from start-ups to enterprises derive value from UX. While running their own UX consultancy, they created and applied the UX Lifecycle. Since then they have both continued to grow their knowledge through implementing UX solutions and learning from others. This book will answer the questions that they have been asked time and again by businesses seeking to embrace and leverage UX. If you would like to learn anything about UX, don't waste your time with this book. You will learn nothing at all. It does not teach you anything about UX, only about the managerial processes that are suppose to be implemented in order to have a good UX. This book provided a good birds eye view of UX but it felt overly simplified and surface level. Gems like "UX is a process and not a position" are often framed with obvious comments like "UX involves change which can cause friction in an organization." This is a good book for business people wanting to learn about UX who have never heard the term before. But if you really want to implement UX in a company you will need more in-depth resources. If you're a UXer already hoping to learn more about the process and business impact this book may be worth a skim but overall maybe a pass. The digital audio version of this book could definitively improve the INDEX of the book. It's impossible to know the content of the chapters if they are named Chapter 1, Chapter 2 and so on. Useful and practical examples. As someone in the industry, I would say it’s pretty accurate and useful. The narrator was good but at times had some strange pronunciations of certain words. This is a very informative and well written book. But, it's not a great book to listen to. It's the type of book you want to read. I thought a lot of the information was repeated throughout the book. The content was pretty dry. It talks a lot about strategy, roles, and the how but not too much about the what. So it seems very high level. The examples used for measuring analytics were pretty much "abandoned shopping carts" but didn't go in to much detail about what tools or actions might be taken to improve check outs.